Vibrant and spectacular, the Rhapsody Award design gives new life to the traditional crystal trophy. This design combines clear crystal and black glass to create an award that reaches new heights, while bevels bounce rays of light in every direction creating illustrious reflections. Production lead time for this trophy is 13 days. There's nothing humble about this towering optic crystal award. Equally high on style, the Rhombus IV features coordinating diamonds that reach for the Heavens like Lucy In The Sky. The well-designed base continues the diamond theme while providing ample room for your logo and message of approval. 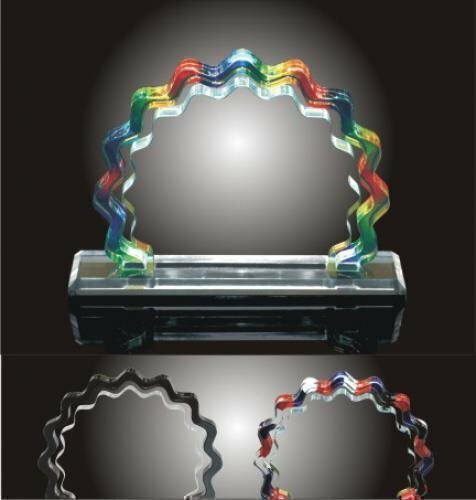 Our Ribbon acrylic award comes wit a colored ribbon around the laser cut acrylic center. Your choice of acrylic ribbon. This horizontal slim gift is a wonderful display piece to capture a personal memory or a corporate message. The Ridgley Award is made of magnificent optical crystal, and its base includes squared edges. With its shiny multifaceted crystal diamond on top of a glossy black crystal base, this award is impressive even to the highest executives. 8" x 2 1/2" x 2 3/8"
9" x 3"x 2 3/4"
10" x 3 1/2" x 3 1/8"
Precisely cut from optic crystal, the facets of this impressive award promise to shine like a star in the night. A most fitting presentation for your stellar performers. Rise to the top with our Rising Star award. This award has a beautiful star that is placed at the top of a curved column. 8 1/2" x 3 1/2" x 3 1/2"
10" x 4" x 3 1/2"